Producer Alethea Arnaquq-Baril speaks about the film The Grizzlies to guests during TIFF's 2018 Canadian Press Conference, in Toronto on Aug. 1, 2018. 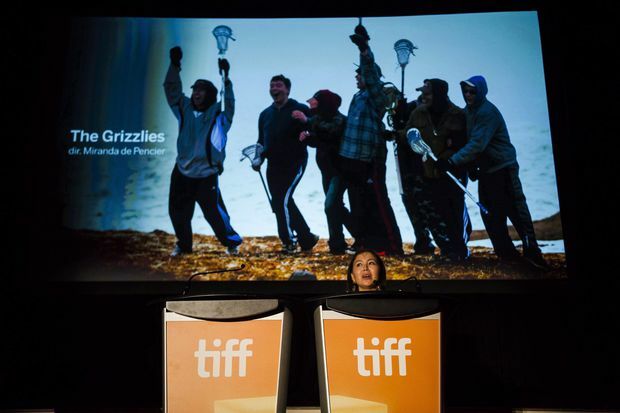 Audiences in remote northern Indigenous communities will be among the first to see the upcoming film “The Grizzlies,” based on the true story of Inuit youth playing lacrosse in a small Arctic community. A gala is being held Wednesday in Kugluktuk, Nunavut – home to the sports team that inspired the story – as part of a tour of the film across 33 remote Inuit and First Nations communities. The tour, set to run through May, has already hosted several screenings in Nunavut, and is set to make stops in Iqaluit, Yellowknife and Inuit communities in Quebec and Newfoundland and Labrador. Each advance screening will include a Q-and-A with a real Team Grizzly player, an actor or a member of the film’s production team. Producer Alethea Arnaquq-Baril says a local mental-health worker will also be on hand to provide support to members of the community who may be struggling. Arnaquq-Baril says “The Grizzlies” is uplifting, but deals with difficult subject matter, and the team behind the film took great care to make sure it was presented responsibly. An educational curriculum about mental health will be rolled out later this year as part of the film’s release to high school and university audiences, says Arnaquq-Baril. The package will include video clips from the northern tour, as well as footage from workshops that were held with Inuit actors and youth during the film’s development. The production team conducted a widespread search across the Arctic to cast the film, which had a crew that was more than a third Indigenous. Last October, “The Grizzlies” director Miranda de Pencier won a Directors Guild of Canada Award for outstanding directorial achievement. Screenwriters Graham Yost and Moira Walley-Beckett are currently finalists for a Writers Guild of Canada award for feature film. “The Grizzles” is set to hit theatres in 100 cities across Canada on April 19.